My time here at the Escapee's Benson, AZ facility is slowly drawing to a close. Plans now are to take the Mini further west to Quartzsite for the Big Tent RV show and two weeks of boondocking on the BLM land south of the town. 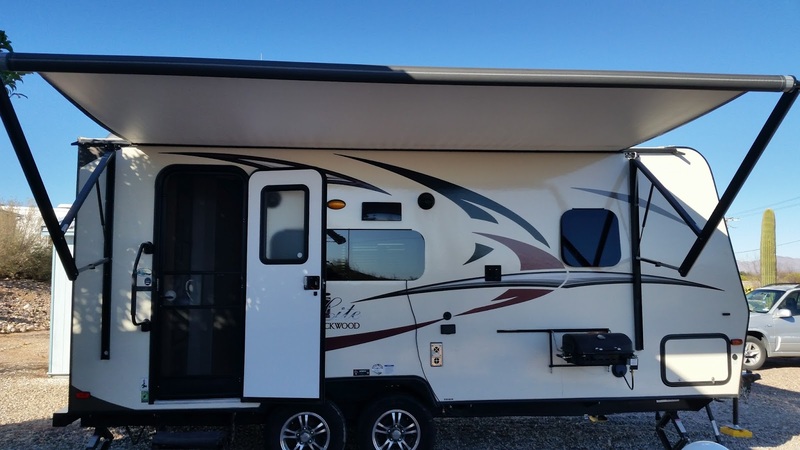 I've got a couple of years experience with desert boondocking and I've come to a couple conclusions about what it will be like staying there in the Mini. First, it can get really windy in western Arizona in January and winds can come up in a hurry. When I camped there in the Tank it wasn't the biggest deal because the Tank didn't have an awning. The Mini has a large awning and it really helps shading the sunny side of the trailer from the sun but a strong wind could easily make it act like a sail and flip up, possibly damaging the awning and also the roof of the Mini. The two awning kits and a awning mat in the middle. The second major problem you experience when boondocking in the desert is the amount of sand and dirt you track into your RV (it is the desert after all!). With the Tank I can recall having to sweep it out several times a day which was a pain after a few days. I also bought a 6 foot by 9 foot awning mat that I plan to deploy under the awning and in front of the steps up into the Mini. 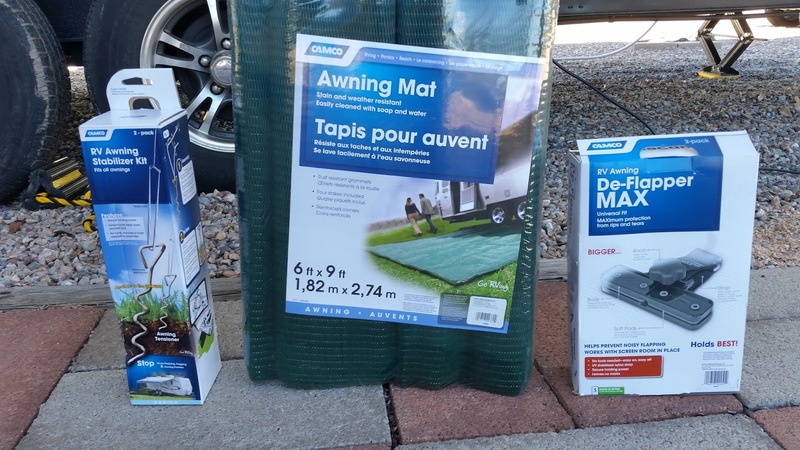 The mat comes with four stakes to secure it to the ground and is made up of a fibrous material that allows sand and dirt to drop through it instead of remaining on the mat's surface. We'll see, I guess. I'll post pictures of the gear after I've deployed it after I pick my campsite at Quartzsite. Plan is to depart from here January 17th break the four and a half hour drive in two by stopping and getting a few more things I'm going to need at a Home Depot in Tucson.